The Night Circus only opens at night and it pops up unannounced and seems to follow no set schedule. The circus however, is not your run of the mill circus. There are tents that you can't even imagine, tents that amaze and surprise, and not to mention the food. It is not something you sit through, it is something you experience, something you will always remember!A young girl and boy are chosen for a challenge, that will put their training to the test. They don't know who their opponents are, when the challenge takes place, where it takes place or even what it consists of. As a reader you are also asking all these questions, and the way the answers get revealed is magnificent!It is very hard to discuss the characters, as there are so many and they were all so interesting and different. 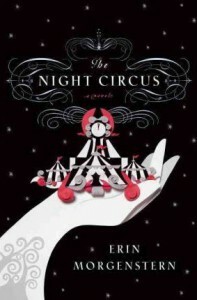 And I can't give much more away regarding the plot, it is something you will have to explore yourself.The Night Circus is one of those novels that plays with your imagination, it delights and leaves you marveling at how you feel the story with all your senses. So richly described and well thought out, that I felt I was at the circus. The only reason The Night Circus didn't get 5 stars from me was the fact that at times I felt a bit lost between all the names and places, but don't let this deter you. Read it if you love magic and the wonder that is a circus!I cannot tell you guys how much I want it to be real.More books like this please!